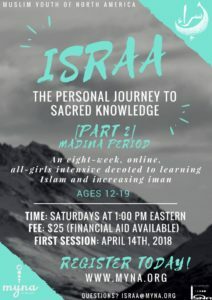 MYNA is excited to announce a new, all-girls intensive called ISRAA: The Personal Journey to Sacred Knowledge, devoted to learning Islam and increasing iman. Part 2 of this initiative is just around the corner – an eight-week course covering the Madina Period, hosted by Ustadha Noura Shamma! These sessions will be held on Saturdays at 1:00 pm Eastern. The first session is April 14, inshaAllah – don’t miss out!